I need an ID on a (probably young adult) sci-fi novel I don't remember finishing. I read it sometime in the late nineties or early noughties. The library book didn't show any obvious indications of age that I recall. The book was in Finnish but I think it was a translation. The cover image was a person with long chains of cabled-together cylinders projecting diagonally upward from the back of their neck. It almost looked like they were hooked into something by those. The main protagonist is a young nobleman, I think the term was "Lord", from a ruling family. This class of nobleman is characterized by having databank neural implants dangling from the back of their neck. These databanks are heavy enough to affect the wearer's posture, and the result was described as a lordly slouch. The story starts with the main character's coming of age ceremony, where they get the databank implants. There's a scene where the character gets a new set of clothes for the occasion, with his family crest cleverly worked into the decorative patterns by his mother. After the actual implantation, the ceremony is interrupted by a coup of some sort. The main character has some trouble evading pursuit because he is wearing his family crest prominently. Somehow, he ends up outside the city, which is on some sort of stilts. For whatever reason, he can't return to the city, maybe he locked himself out or he was hiding from the coup. This results in the character's first experience of being outside. I remember a scene where he's looking at the moon and pulls the hard data on said celestial body from his databanks, and then decides to look up poetry instead. Some time later, the main character ends up living in a village of outsiders. The last scene I remember is that one night he overhears the men in the village singing about how their people had once been slaves to the Lords. That's where my recollection of the plot ends. It is not Aristoi by Walter John Williams; the story didn't mention splitting one's consciousness, and in the Aristoi setting the databank seems to be "in the cloud" rather than as external add-ons. 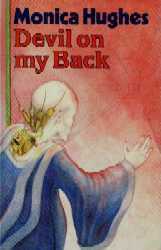 "Devil on My Back" by Monica Hughes. In an ambiguous future, the Earth has gone through an unnamed "Disaster" and subsequent "Age of Confusion." During this, a group of scientists build a great self-controlled city called Arc One to house the survivors and save all human knowledge. Knowledge has been regulated to devices called "info paks" which enable the wearer to tap into Arc One's computer to access the information, but with a caveat: info paks may be rejected by the wearer. Those who reject the info paks become slaves, soldiers, or workers. Those who accept the info paks become Lords of the City, and the effective ruling class. Many generations later, the son of one of the leading Lords of the City, Tomi, is on his Access Day, the day when he first gets to receive his final info pak, and gain total access to Arc One's computer. Two of his close friends reject the info paks, and become a slave and a worker respectively. Sensing Tomi's discomfort with how his friends violently reacted against the info paks, Tomi's teacher prescribes recreation at Dreamland, a fantasy computer program. The next day, during a ceremony to honour the New Lords, the slaves rebel. Tomi is taken prisoner but manages to escape and hide in a garbage chute. However, when the soldiers arrive to gas his captors, Tomi loses consciousness and slides down the chute, emerging outside the City in a rapidly flowing river. In the outside world, Tomi encounters a primitive community living in freedom, and is confronted with shocking truths about the world he left behind.